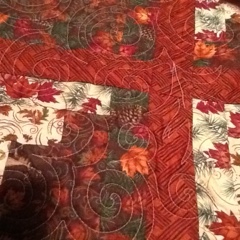 Ohhhh, it's so nice to be quilting again! I enjoyed Christmas, but love being back to normal. 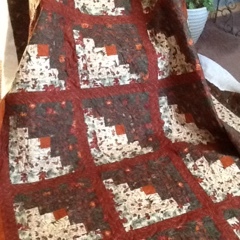 This morning, I finished machine quilting this customer Log Cabin quilt. 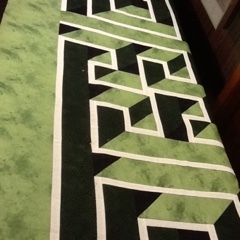 This is a large bed size quilt pieced with outdoor type fabric. 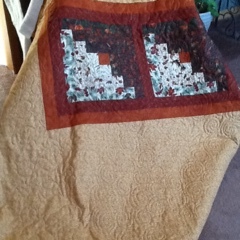 So, I quilted to match that fabric...swirls and leaves. You can't see, but the wide 3 strip border is completely leaf vines. I am piecing a Big Star quilt, maybe for myself?....maybe! 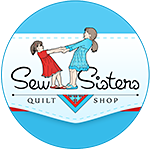 We are near the end of our 100 club quilt, and getting together tomorrow with Connie, and Marla to work on our bargellos. I'll have pics next time of these ones...waiting for more quilts and orders to arrive. Lovely quilting on the Log Cabin. It is so nice to be back to a normal routine again. Your Log Cabin looks wonderful. Beautiful work! 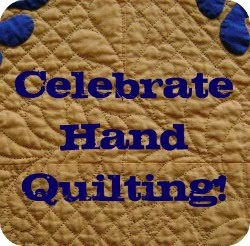 I especially like the 3D effect on the one you are hand quilting.